They called it "Tears of the Gods"
Amber is fossilized tree resin, which has been appreciated for its color and natural beauty since Neolithic times. Much valued from antiquity to the present as a gemstone, amber is made into a variety of decorative objects. 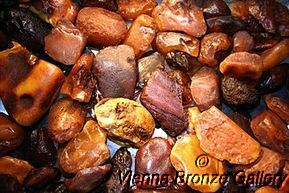 Amber is used as an ingredient in perfumes, as a healing agent in folk medicine, and as jewelry. Amber is sometimes called the Gold of the Baltic Sea. Amber jewelry is a product of nature, with its unique inclusions, colors and textures. Every piece is unique and cannot be exactly duplicated. It is not just jewelry, but a product of value, symbol of eternity and luxury. 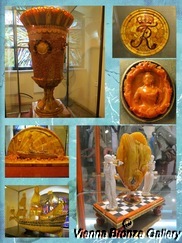 Amber is also known for its healing properties as it was used for that purpose for many centuries. Scientific research has determined that amber worn against the body releases natural oils onto the skin that are then circulated into the bloodstream. Pieces of amber torn from the seafloor are cast up by the waves, and collected by hand, dredging, or diving. Elsewhere, amber is mined, both in open works and underground galleries. The world's largest Amber deposits come from the shores of the Baltic Sea, where Amber has been harvested, traded, and crafted into decorative objects for at least 13,000 years. Amber is thought to be a bit of the sun with the power to bring good fortune. The Greeks called amber "electron," which led to the modern word for electricity. Amber can give off sparks when rubbed, which may be why it is considered a lucky charm. Both Chinese and Muslim cultures burn amber as incense, to protect against evil spirits.